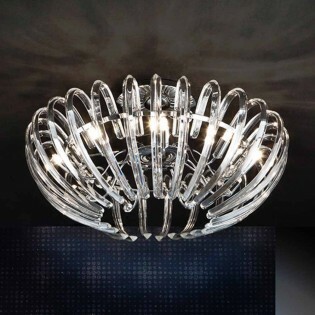 Ceiling flush light Argos of modern style, with metallic structure in glossy chrome finish and rounded lampshade in mirrored glass with decorative interior tears of murano type glass. Exquisite finish, perfect for illuminating living rooms or bedrooms of a modern style. Dimensions: High 23 cm. Diameter 40 cm. 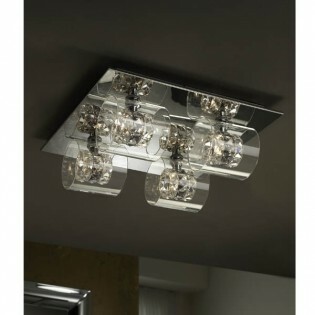 Ceiling flush light Argos of modern style, of lampshade glass mirrored with decorative interior murano glass tears. Chrome finish metal structure. 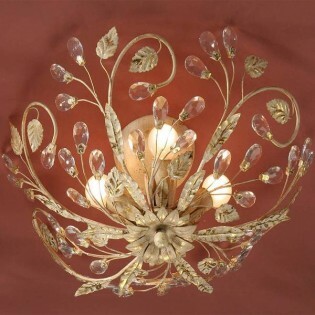 Exquisite decorative effect and perfect for lighting modern living rooms or bedrooms. Dimensions: High 25 cm. Diameter 50 cm. 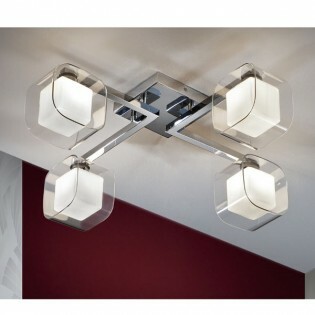 Ceiling flush light geometric of a Modern Style, made of steel and metal with chrome finish. double Lampshade glass, opal glass interior and transparent glass exterior. Versatile design for installation on ceilings in bedrooms, hallways, living rooms and other rooms of the house. Dimensions: High 18 cm. Width 59 cm. Ceiling flush light> from the collection Andromeda with Light Bulbs LED included for you to save on your electricity bill. It has a beautiful Lampshade with a truncated mesh mesh in a chrome finish decorated inside with chrome-plated glass chains and bubbles. Dimensions: High 33 Cm. Diameter 37 Cm. Ceiling flush light from the collection Ariadna with nine Light Bulbs LED included. Design with structure made of chromed metal and Lampshade made up of several transparent glass bars. Available in chrome or gold finish. Perfect for moderns decorations in rooms such as dining room, living room or bedroom.Dimensions: High 26 cm. Diameter 53 cm. Ceiling flush light with integrated 68 W and five 7 W Light Bulbs included. 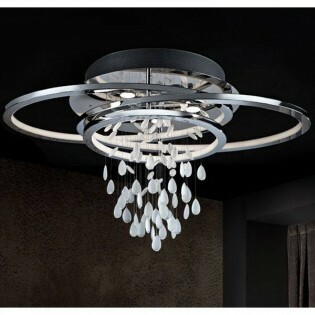 It has a circular structure made of metal with a chrome finish and decorated with glass tears. It also has a white methacrylate interior diffuser. Dimensions: High 50 Cm. Length 90 Cm. Width 53 Cm. Ceiling flush light from the collection Dana with circular design made of metal and steel with Transparent and amber glass decorating the whole structure. Integrates 18 W LED light, an innovative technology with which you save on light consumption. Dimensions: High 8 cm. Diameter 23 cm. Ceiling flush light Elis with asymmetrical design. Structure made of chromed metal decorated with strips of faceted glass copens squareds and diffuser made of opal glass. Inside there are six Light Bulbs LED (included) with Warm light effect. To illuminate living rooms or dining rooms classic style.Dimensions: High 16 cm. Diameter 54 cm. 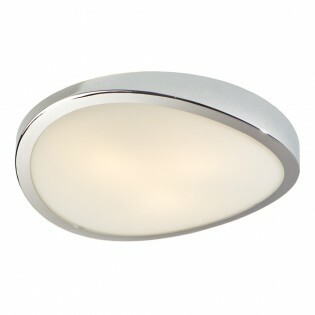 Ceiling flush light ideal for lighting bedrooms, dining rooms or classic style living rooms. The lampshade is made up of glass bars Transparent designed in a curvy shape and incorporates eight points of Lighting LED, Light Bulbs with which you will achieve a minimum Consumption of light.Dimensions: High 22 cm. Diameter 67 cm. 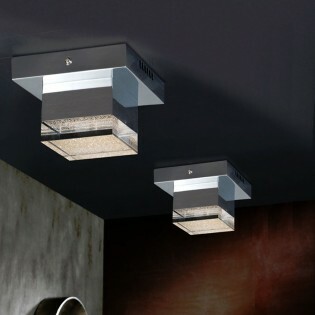 Ceiling flush light with lighting LED 20w from the collection Linur. Original but simple design composed of elongated shapes in wavy shapes. It is made of aluminum and metal with a Perfect chrome finish for use in dining rooms, living rooms or other rooms of a Modern Style. Dimensions: High 6 Cm. Length 103 Cm. Width 17 Cm. Ceiling flush light Minerva with a body composed of corrugated chains made of nickel plated metal. Height dimmable. Perfect for rooms decorated with classic and elegant style. Dimensions: High 30 - 40 cm. Diameter 45 cm. 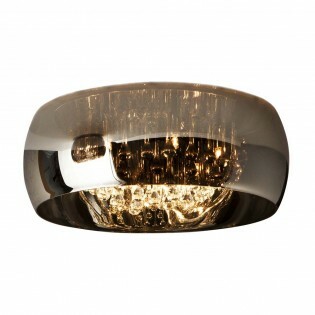 Ceiling flush light Minerva with fine nickel plated metal chains. 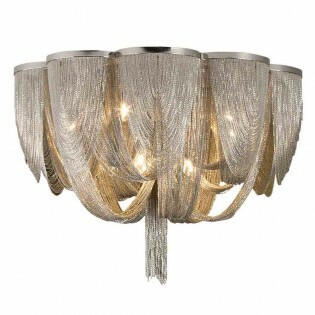 It is Perfect for lighting your dining table or as a general light in the living room, bedroom etc. includes ten Light Bulbs LED (less consumption than traditional ones).Dimensions: High 50 cm. Diameter 68 cm. Ceiling flush light with four lighting points LED (integrated). The structure is made of metal with a chrome finish and the transparent acrylic lights are cube-shaped, with a textured part, thus creating a daring and modern design. To place in your home, in rooms such as the dining room, living room, kitchen etc. br />Dimensions: High 12 cm. Diameter 32 cm. Ceiling flush light with integrated light LED 4 W. It is a prism-shaped design with a main structure finished in chrome and Lampshade Transparent, the top part textured. conOUT doubts, an original Lamp that can fit in different rooms: living room, kitchen, dining room etc.Dimensions: High 10.5 cm. Diameter 14 cm. Ceiling flush light with Light Bulbs LED already included, 6 W each, with Warm light type. 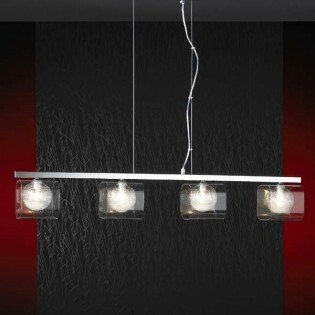 Made in metal with chrome finish and decorated with beautiful pieces of faceted glass in a Transparent and smoke finish. Ideal to give a classic style to your dining room, living room or bedroom.Dimensions: High 12 cm. Diameter 43 cm. Ceiling flush light Satin with five lights LED included (30W), 6W each Light Bulb, Warm light. Original wavy design with faceted glass in a Transparent and smoke finish covering the entire chrome-plated metal structure. It will fit especially well in classic decorations of dining rooms, living rooms or bedrooms.Dimensions: High 15 cm. Diameter 54 cm. Impressive Ceiling flush light for ceiling in circle shape with different thicknesses, Width frame made of metal chrome gloss and opal glass diffuser. Easy to use effect installed in living rooms, dining rooms, halls or bedrooms with modern decoration. Dimensions: High 10 cm. Diameter 48 cm. Impressive Ceiling flush light conical, lacquered steel profile with anodized aluminum lampshade and cast Acrylic diffuser. Finished in matt white. Very nice in living rooms, dining rooms, halls or bedrooms with modern decoration. Dimensions: High 21 cm. Diameter 48 cm. Ceiling light with several lighting points LED, ten in total. 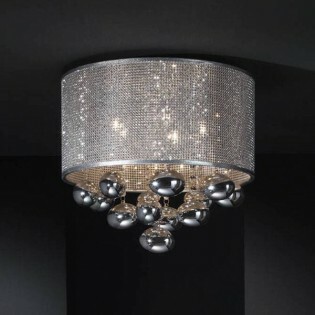 Made up of original polycarbonate spheres, stepped effect and part made of chromed metal. In addition you can adjust the height of each light point getting results of 10. Ideal for hotels or houses with a spectacular style. Dimensions: Height 105 - 250 cm. Diameter 45 cm. 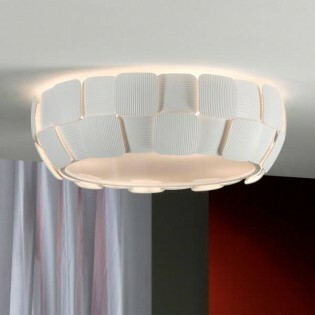 Flavia ceiling light. 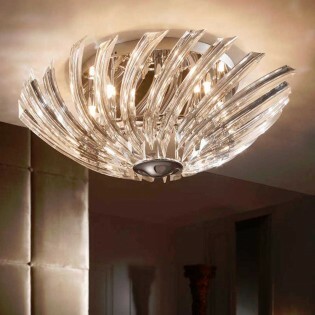 Ceiling base made of chromed metal and polycarbonate bottom in a staggered fashion. Its small size is perfect for placing several in series in rooms such as the corridor. Lighting LED integrated 5 W, will offer high performance with high efficiency and low power consumption. Dimensions: Height 13 cm. Diameter 13 cm. 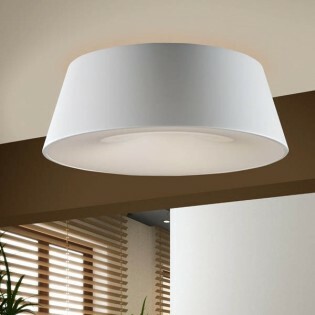 Ceiling light Rocio (five Lighting points) with light LED dimmable 25 W via Remote control (included). Finished in gold-plated or chrome, two models available. Structure made of metal with oval-shaped glass lampshades. Possibility to adjust the Height. Dimensions: High 45 - 150 cm. Diameter 30 cm. 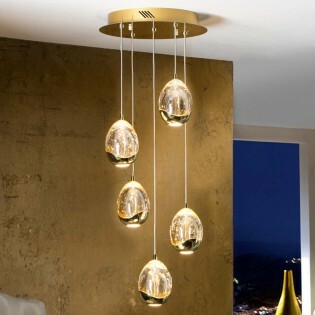 Ceiling light Rocio with fourteen Lighting points LED of which you can regulate its intensity (Remote control included). It is manufactured in metal and finished in chrome or gold. The designed by his drop-shaped Lampshades made of glass and the possibility of regulating the Height of the lamp stand out. Dimensions: High 100 - 200 cm. Diameter 50 cm. 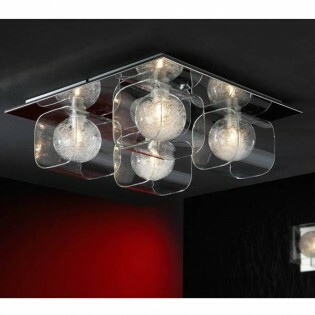 Ceiling light (4 lights) of modern design with chrome-plated glossy metal frame and moulded glass lampshades with an inner ball decorated with glass filaments. When lit, it has a very nice and elegant decorative effect. Perfect for salons of a Modern Style. Dimensions: Width 98 cm. High 18 cm. Bottom: 12 cm.-Installation height: 35 - 135 cm. dimmable. Pendant light LED to save on your electricity bill. 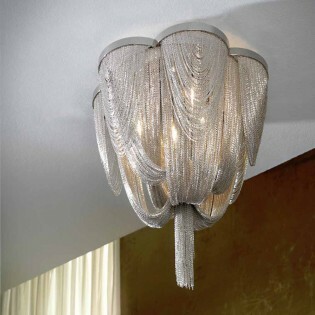 It has an elongated design made of glass and decorated with an antique effect cord. The main structure is made of metal with a black oxide finish. 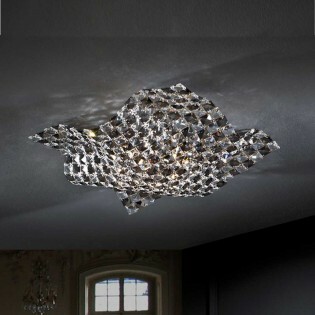 Ideal to illuminate your dining room, living room etc. Dimensions: High 180 Cm. Diameter 20 Cm. Ceiling light Adela with five lights LED, 4 W each Light Bulb. lampshade in oval form white cloth with band on the bottom of glass Transparent. On the other hand, the structure has five wavy arms finished in silver and aged silver plan parts. Set it up by adjusting the Height as needed in classic rooms. Dimensions: High 50 - 80 cm. Diameter 55 cm. Ceiling light Aldair 19.4W. Its LED Lighting is much more powerful and efficient than traditional Lighting. It is made of metal and aluminum with chrome finish and designed in a circular shape. Ideal for placing in your dining room, living room or bedroom of a Modern Style. With Acrylic diffuser Dimensions: High 150 Cm. Diameter 40 Cm. Alessa LED hanging lamp with adjustable height. The metal structure available in gold and chrome finishes presents a modern design. On the other hand, its moulded glass lampshade gives it a retro look. This combination of styles makes it ideal for illuminating bedrooms and living rooms.Dimensions: Height 30-120 cm. Diameter 11 cm. 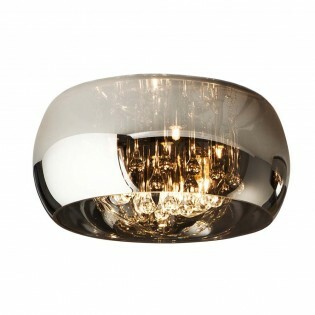 Large ceiling light to give a fantastic overall light to your living room, dining room or bedroom. Integrated set with 25 W LED lighting, circular shape made of chrome-plated metal and faceted cockset pendants topped with almond trees that create a spectacular result. Dimensions: Height 75 - 185 cm. Diameter 80 cm. Ceiling light Andromeda, Height dimmable, with eight Light Bulbs LED of 6 W each ( include) perfect for classics stays or luxurious decorations, preferably in living rooms or dining rooms. The lampshade is made of vinyl with a die-cut mesh mesh, and inside, glass chains formed by chrome-plated glass bubbles. Dimensions: High 55 -160 cm. Diameter 60 cm.